The IGNITE Guelph-Humber candidate forum Thursday gave special interest to issues of accessibility and transparency. 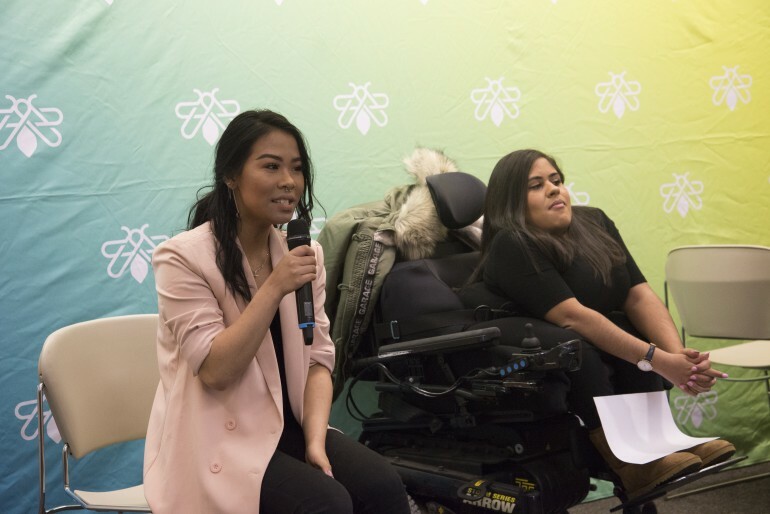 Forum participants included the two presidential candidates, Allisa Lim and Monica Khosla; three University of Guelph-Humber vice president candidates, Maheen Nazim, Rose Bonello, and Harry Carlisle Swindall; and six of the eight Guelph-Humber nominees for the board of directors. The election hopefuls came together to share their platforms and answer questions given by the panel consisting of current IGNITE president Maja Jocson and the board of directors’ chair, Nicholas Davenport. There was also an opportunity for candidates to address student questions. Issues brought up in the forum included accessibility and transparency in IGNITE, as well as academic concerns, parking, and student opportunities to have their opinions be heard. Guelph-Humber vice president candidate Harry Carlisle wants to expand carpooling services and bring solar-panels to the GH campus. He also promises to implement push-activation buttons on every classroom door at Guelph-Humber to allow for easier access. VP candidate Nazim proposed a three-pillar plan to build a community at Guelph-Humber with an emphasis on accessibility. She wants to make safety procedures more accessible to those in need. VP candidate Bonello doesn’t want to just see change, she wants to be a part of it. That starts with better communication, she said. Following the end of the strike last semester, Bonello said students returned to school uncertain if they would be able to finish the school year on time. Khosla said her platform is all about accessibility, awareness and advocating for students. Lim, who is currently Lakeshore vice president, said she wants to increase opportunities for students on campus. “We’re really the voice of the students,” Lim said. Khosla was asked how she would achieve her platform promises and replied she’s going to emphasize communication. She said that by taking the time to talk to students rather than handing out surveys shows you actually care. The panellists then asked the presidential candidates how they would use their platform as leader to ensure accountability in all IGNITE roles. Khosla said she would hold smaller meetings so opinions can be heard because big groups prevent some people from speaking up. The role of the president is to instruct their team and teach the executives what steps to take to see their projects realized, Lim said. It is up to the president to ensure their team is staying on track and utilizing all resources to be successful, she said. Lim said her top priority as president would be teaching new executives how to excel in their roles and be able to lead their own projects. Khosla’s top priority as president would be giving transparency to IGNITE. After working at the organization, she said she’s met many students who are unaware of what IGNITE can do and what they offer. Part of the issue with IGNITE events held at Guelph-Humber is they’re always held on the first floor, Khosla said. Most people don’t know about these because more time is spent on the second floor. She would like to bring these events to spaces where people are, she said. Lim said the issue of transparency concerns the IGNITE budget and the students. Executives work on something called “fee protocol”, she said, which allows students the chance to understand what their tuition goes towards. Executive videos, which IGNITE just launched this year, also tell students what the student government is working on, she said. When questions were opened to the forum audience, a member asked the candidates how they would ensure an IGNITE presence at the Guelph-Humber campus. Khosla said she feels many IGNITE events are held at the North campus and would change it so events were divided equally among all Humber and Guelph-Humber campuses. Lim said she would utilize student feedback and work with her team to change their methods. Another candidate forum will be held at North campus on March 5 in the Student Centre and at Lakeshore on March 6 in the L Building cafeteria. Voting will open the week of March 12 to March 16, when the polls will close and winners will be announced.